BELFAST fight fans will be hoping to salute their latest world champion on June 10 when Ryan Burnett challenges Lee Haskins for the IBF bantamweight title at the SSE (formerly Odyssey) Arena. The pair came together earlier yesterday (Wednesday) at the Europa Hotel for a press conference to officially announce the showdown between experienced champion and hungry young challenger that is an intriguing match-up. Haskins won his title against Ivan Morales in Cardiff 12 months ago and has since defended the belt against Stuart Hall to cap an impressive career for the 33 year-old Bristolian who has also claimed European, British, Commonwealth, English and WBA Inter-Continental belts. However, Burnett (16-0) will be keen to prove that now is his time after serving his apprenticeship, mainly in England, and claim the title he craves in front of his home support as world championship boxing returns to the city. “This is something I’ve been wanting for a long time, through all the hard work and ups and downs I’m eventually here and I’m very excited for this fight,” said the 24 year-old Newington native who received a rapturous welcome. “I can’t wait to get my hands on that world title and to start bringing big fights to Belfast. Haskins’ manager, Jamie Sanigar believes this chance has come much too early for Burnett and with the show named ‘Belfast Boy’, he expects his man to show the crowd just who is boss on the night. “We had a little chuckle when we seen the name of the show on Twitter and that’s what this is – a man against a boy,” he said. “Lee Haskins is a (decorated) champion. In the last nine-and-a-half years he’s only had one defeat. “He’s beaten world champions. Lee is a tremendous talent and he doesn’t get the credit he deserves as one of Britain’s world champions. “The thought of coming to Belfast doesn’t faze Lee. He’s fought everywhere including a town square in Morocco. Haskins (34-3) was less disparaging of Burnet’s chances in this fight and is expecting a tough examination of his credentials. He knows he will be entering the lion’s den on June 10, but with a wealth of experience, the affable, laid-back Haskins believes this is his opportunity to add to his own impressive legacy. “I’ve watched a lot of Ryan Burnett and I’ve always thought he was a great talent,” he said. “He’s working with Adam Booth so they’ll both be ready for this fight. “I’m coming to the end of my career so I want these tough fights and prove I still have it. Booth, the highly-rated trainer has been working with Burnett since 2014 and says he always felt he had a special talent on his hands. While he has supreme confidence his man will prevail on the night, he is certainly taking nothing for granted and knows it will take a career-best performance to dethrone the Bristolian. “I want to give Lee Haskins a lot of credit and respect. He’s been around the block for a number of years and he knows how to win,” said Booth. “My belief from day one was that Ryan Burnett is special. Time catches up with everyone. “When Lee was a pro in 2002, Ryan was probably bunking off school. Boxing throws up situations like this that are incredible. “I know full well that Lee Haskins is the type of guy that a lot of people will make the cardinal mistake of underestimating, we won’t. While Burnett will be the star attraction on the night despite being the challenger, he insists there is no pressure on his shoulders and that the risk of losing does not worry him given he is yet to come into his prime and gets his first world title opportunity at such a young age. Instead, he believes all the pressure is on Haskins to retain his title and is confident he can capture the belt and keep it in the city for a long time to come. “There’s no pressure on me,” he insists. “I’m only 24, this is all new to me. There’s no pressure on me whatsoever. “If there’s pressure on anyone, it’s Lee Haskins because he’s the champion coming to my back yard to defend his belt. “All the pressure is on him, there’s no pressure on me. I’ve paid my dues across the water. I moved to England and had all my fights over there. The June 10 undercard is to feature a host of local talent with Coalisland’s Fearghal McCrory set to feature, as will Matthew Wilton. 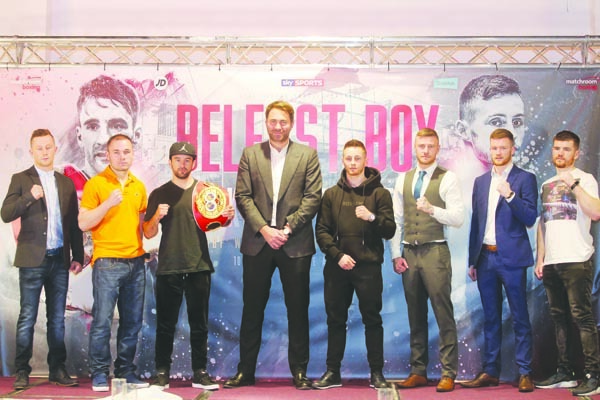 There are already a quartet of West Belfast boxers added to the bill, with James Tennyson, Paddy Gallagher, Padraig McCrory and Paul Hyland Jnr on the card along with North Belfast man, Sean Magee and all will feature in meaningful fights according to Matchroom promoter, Eddie Hearn. Tennyson could be fighting for the IBF Inter-Continental title in what would represent a major step up against Australia’s Joel Brunker whose only losses to date have come against Lee Selby and Josh Warrington.